"From the beginning to the end, I was impressed with Carolina Energy. Their communication skills all thru the job were..."
"Peter was very professional and explained what he was doing. He represented the Company well." Peter was very professional and explained what he was doing. He represented the Company well. "Very informative, answered questions completely." Very informative, answered questions completely. "Peter Barczak did our install. He did an excellent job from start to finish. He even came 2 hours early to beat the rain that..."
Peter Barczak did our install. He did an excellent job from start to finish. He even came 2 hours early to beat the rain that they called for. "Peter was very professional, went right to the task at hand, very knowledgable of the installation process and clean up was a..."
Peter Barczak has over 30 years of diversified experience in the construction and real estate industries. Peter has earned B.S. in Business Management with honors from J&W Univ. of Providence, RI. and he is working toward an M.S. in International Business. A former realtor with several years of executive level sales experience including V.P. of sales for a successful Hollywood movie equipment dealer give Peter an in depth knowledge of how to satisfy a customer. 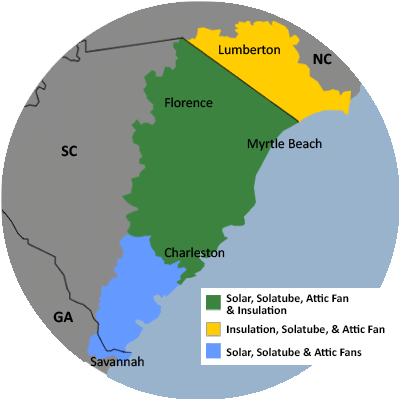 Most recently, Peter owned and operated Gold Star Trim Carpentry in Murrells Inlet for eight years prior to joining forces with Carolina Energy Conservation. Peter currently has plans to become LEED certified in order to bring additional value to C.E.C.. Peter has an extremely keen eye for quality and an unrelenting desire to see that all details are seen to completion. When Peter has free time he enjoys Gardening, woodworking and traveling the Carolinas in his Motorhome. This kitchen was too dark for the couple who lives in Little River, even with the lights on, so they called Carolina Energy Conservation to come in and install a Solatube to help make their days just a little bit brighter! Now they can reduce the amount of harsh lighting in their kitchen and enjoy the beauty of natural daylighting. This Conway, SC homeowner had a beautiful living room - but no one could see it! The room lacked in the lighting department. They called Carolina Energy Conservation to help restore the electrical in their living space. We installed two 14-inch ISn Solatube lights in the ceiling to brighten the room. The finish is "Just Frost," giving the room a clean and contemporary finish. With few windows in their dining area, this customer was looking to brighten up the area with natural light. A Solatube was installed just over the dining room table. This addition really brought out the beauty of the space and even accentuates the existing chandelier above the table. Another beautiful example of natural lighting! This Murrells Inlet homeowner wanted to add natural light into their home to make for a more serene living space. A Solatube was installed in their living room. Now, rather that harsh lighting while relaxing and watching TV during the day, this customer can enjoy the natural light from outdoors from the comfort of their couch. Three 14-inch ISn Solatubes were installed in the kitchen, main living area, and bedroom of this Murrells Inlet home. This kitchen area required a lot of recessed lighting to light the whole area. A Solatube was installed to bring natural light into the home all while accenting the decor in the kitchen. Three 14-inch ISn Solatubes were installed in the kitchen, main living area, and bedroom of this Murrells Inlet home. This home in Murrells Inlet, SC was rather dark in a few rooms including the bedroom. The homeowner decided that natural lighting would be a great way to brighten up their home. Three, 14-inch Solatubes were installed in the kitchen, main living area, and bedroom of this Murrells Inlet home. The addition of these Solatubes truly brightened their home and made for a much more comfortable glow throughout the home.